Indian Ethnic Necklace. Pave Diamond Bead Ball. Rose Cut Diamond Bead. Fusion Gold Earrings. Sapphire Jewelry. Designer Gemstone Earrings. Natural Ruby Jewelry. Victorian Earrings. These earrings are set in real 10K Yellow Gold. The Canary Yellow Diamonds are set in Prong Setting. This makes for a great gift for any occasion. Fancy Diamond Color: Canary Yellow. Fastening: Screw Back (pierced). 18K Yellow Gold Wt :- 1.74 gm. Diamond Wt :- 0.20 Ct. Gross Wt :- 1.78 gm. Gold Purity 14k Yellow Gold. Black Diamond Wt. We're not happy unless you are! our jewelry. Wishing you Best Buying.Experience. you may have about. Here is a Fine Round Cut Diamond Stud Earrings. Made from Solid 14Kt White Gold and weighs 2.9 grams. It holds 2 Natural Round Brilliant Diamonds that add to. 66Ct ( 4.7mm & 4.8mm), 48 Natural Round Brilliant Diamonds that add to 1.25CT, and are all G - H Color VS2 Clarity. Clarity:SI1 Enhanced. Certificate:GEL CERTIFIED AND APPRAISED. Type:ROUND CUT. MAIN STONE. Setting:14K WHITE GOLD SCREW BACK SETTINGS. Gold Weight:1.00 GRAMS. Cut:Very Good. Total Carat Weight:1.90 CTS. Total Diamond Weight: 1.80 Carats t.w. - Special Cut Superman Brilliant Cut. Item Type: Stud Earrings. All hand set and looks like you spent way more. Diamond Color: G -H. Gemstone: Diamond. Backing: Solid 14K White Gold Push Backs. This popular matched pair of genuine round brilliant cut color enhanced diamonds studs are prong set in solid white gold. Both earrings are secured by push backs in a three prong martini setting. THE ORNATE ANTIQUE DESIGN OF THESE EARRINGS IS A SHOW STOPPER. THE DELICATE WORK ON THEM MAKES THEM EVEN MORE UNIQUE AND GLAMOROUS. ON THE BACK THE GOLD LACE WORK IS A WORK OF ART, THESE ARE JUST SPECTACULAR. Mens Ladies 10K Yellow Gold 3D Square Real Diamond Domed Stud Earrings 1.85 Ct. These earrings are a part of our new diamond studs collection. Set in 10K Yellow Gold, these studs feature full brilliant round cut white diamonds in pave settings. All diamonds are prong set for extra security. Clarity:VS1 Enhanced. Type:ROUND CUT. Setting:14K WHITE GOLD SCREW BACK SETTINGS. Gold Weight:1.00 GRAMS. Total Carat Weight:1.75CTS. Carat Weight:1.75. Certificate:GEL CERTIFIED AND APPRAISED. 1.96tcw (AAA) Grade Jet Black Natural Diamond stud earrings with friction backs. Setting is Solid 14k Yellow Gold. We deal direct with diamond cutters and pass the savings on to you! 14k Yellow Gold. These studs are new addition to our Jewelry For Less diamond studs collection. These particular earrings features a big round cut diamonds that are set close together to make up a solitaire look a like. The opals are luminous and eye catching with vividly colorful fire. The diamond pave halo adds a brilliantly luxurious touch. The diamonds and opals are all natural and earth mined. The opals are bright and fiery, showing vivid flashes of red, yellow, orange, and green. Pave Diamond Bangle. Pave Diamond Jewelry. Pave Diamond Bead Ball. Polki Diamond Bangle. Diamond Wedding Bangle. 925 Sterling Silver Jewelry. Designer Gemstone Earrings. Rose Cut Diamond Bead. This gorgeous 1.83ctw matched pair of round brilliant cut natural diamonds are very well cut and have dazzling sparkle! Graded H-I for color, they face up nicely white and will stand out brightly against skin tone. Exquisite 1.80 Carats Natural Diamond 14K Solid White Gold Stud Earrings. 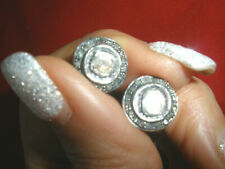 Total Natural Round Cut Diamonds Weight: 1.80 Carats (both earrings) SI2-3 / H. Total Earrings Weight is: 1.4 grams. All pictures are magnified to show the smallest of details. Created Diamond Cluster Stud Earrings. Our created diamonds emit every shade of light that a natural diamond would emit. The radiance and fire of these created diamonds are equivalent if not superior to a natural diamond of VVS1 clarity and D color with an excellent cut. -I. Total Earrings Weight is: 1.4 grams. All pictures are magnified to show the smallest of details. Rose Cut Diamond Bead. Sapphire Jewelry. Diamond Feather Jewelry. Diamond Clasp and Lock. Fusion Gold Earrings. 925 Sterling Silver Jewelry. Turquoise Diamond Jewelry. Designer Gemstone Earrings. 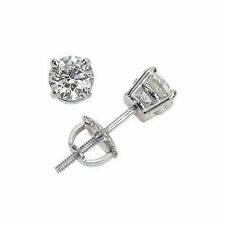 You are Purchasing a Tiffany & Co 1.93 ct Round Brilliant Cut Diamond Stud Earrings. The earrings mountings are 950 Platinum that weigh 2.8 grams. Diamond Earrings Setting. Diamonds Total Weight 1.93 ct.
Diamond Clarity: VS2. Shape: Round. Main Stone: Genuine Diamond. Total Carat Weight: 1.75CT. EGL CERTIFIED DIAMONDS. Clarity: I1. Polish: Very good. - Earrings have screw backs. DIAMOND #1. - 2 round diamonds (1.94ctw). Polish: Good. Shape/cut: Round brilliant. Photos are only for presentation purpose only. KPCS certificates are issued for large quantities above 1 lac carats. GAURAV JEWELLERS. our ability. so if you have any concern request you to connect us. (3.2 grams of 10K White Gold | 1.80 total carats of blue, white & yellow diamonds | 10.75mm wide | SI2 - I1 Clarity | H Color | 3D Cube Pave Diamond Stud Earrings). Beautiful pair of earring added to our Jewelry For Less studs / earrings collection. Photos are only for presentation purpose only. KPCS certificates are issued for large quantities above 1 lac carats. IF THERE IS NO NOTE ABOUT RING SIZE WE WILL SEND SIZE 7.5 USA. Photos are taken in under studio light / Computerized so actual item color/shape might be slight differ/chage. Joyaassilver Handmade Earrings Jewelry TPUGI-886. In case you need any clarification or information about any of our products, pls. We shall get back to you within 24-48 hrs. -Joyaassilver Jewelry is Handmade Designer Jewelry. 1.90tcw (AAA) Grade Jet Black Natural Diamond stud earrings with friction backs. We deal direct with diamond cutters and pass the savings on to you! Real Earth Mined Diamond! Each Diamond is. 95 cts. Joyaassilver Jewelry is Handmade Designer Jewelry. 1.90 CTW (Clarity SI1 / Color G-H). Gold Stamped: 14K. Total Round Diamonds Carat Weight is -. EARRINGS WEIGHT IS 1.2 grams. Indian Ethnic Necklace. Pave Diamond Bangle. Polki Diamond Bangle. Diamond Wedding Bangle. Pave Diamond Bead Ball. Rose Cut Diamond Bead. Wide Cuff Bangle. Pave Diamond Jewelry. Pave Diamond Bangle. Polki Diamond Bangle. Diamond Wedding Bangle. 925 Sterling Silver Jewelry. Rose Cut Diamond Bead. Pave Diamond Bead Ball. Wide Cuff Bangle. Pave Diamond Jewelry.